This Swarovski colour is from the Exclusive Range from Crystallized™ - Swarovski Elements. Purple Velvet is a deep rich, royal and intensely romantic purple with silken depths. This is one of the most popular colours among Swarovski enthusiasts. 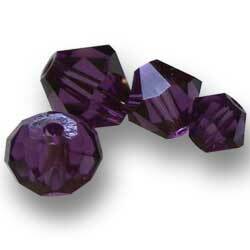 Many a person have enquired and wanted to know what articles/items Swarovski produces in this colour. One would hope a lot but unfotunately that does not seem to be the case. 5020 Helix Bead the 3mm & 4mm are Discontinued - ie Swarovski will no longer produce them in this colour. So if you find them, grab them!! If you are looking for Purple Velvets, you will want to check out ClearlyChosen who has secured and continue to stock more of this exquisite colour.